This is the number of available pitches, all equipped with 3KW electricity included in the price. Toilet facilities in a warm place with hot shower included in the price. Small dining room with tables, chairs and vending machines for hot, cold drinks and snacks. A shuttle service to Bovisa Station is available daily from Monday to Sunday from 9am to 11am. From Bovisa station you can reach downtown in 15 minutes by public transport, with the only cost of the ATM urban ticket. The station is about a 10 minute walk from the park. Our parking area is covered by a free WIFI service to make your stay more comfortable. 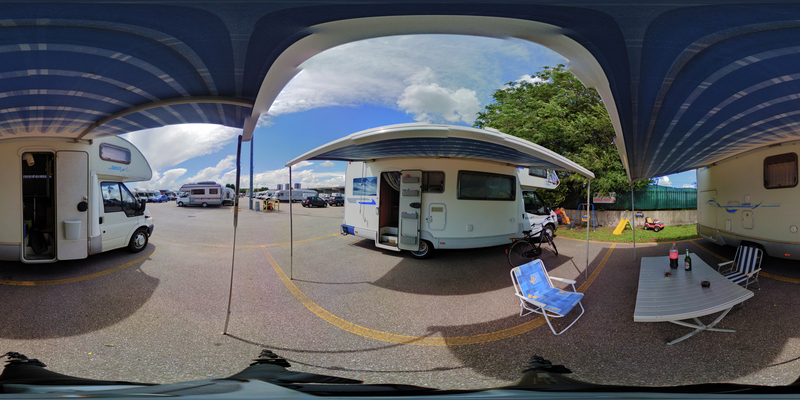 per day, per crew, in the only RV park within the city of Milan with all the best services for an unforgettable stay. Guaranteed by a 24-hour presence of on-site staff and constantly active alarm and video surveillance systems. Don’t miss the opportunity to visit Milan. Follow this link and submit your booking request. We will be happy to welcome you to New Park Milano at any time of day or night.